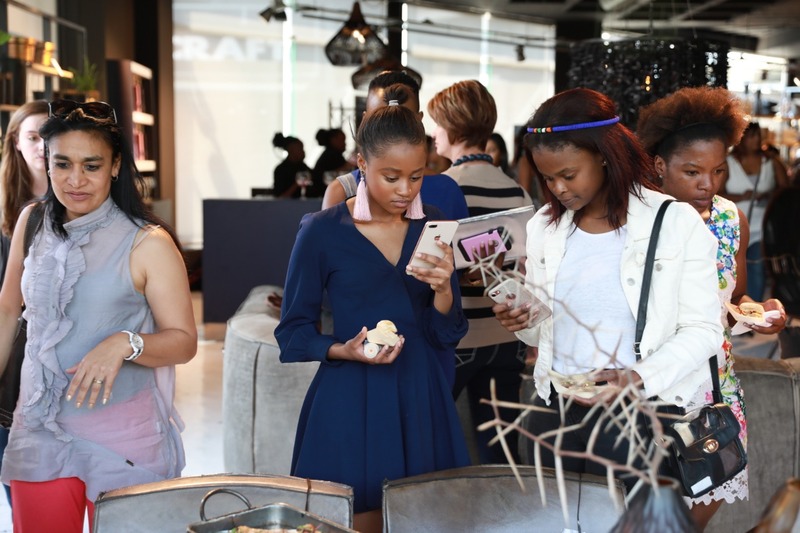 Glamour Magazine hosted its readers for their Glamour Reader Event at Weylandts in Brooklyn on the 16th of September. A bright and sunny day, perfect for the Mirari Gin Cocktails and Canapes they had for us. I'd never been to a glamour event prior to this but i bought the ticket as a gift from me to me, since i'd turned 20 that week. Two days later, I received a bonus +1 Ticket! The event far exceeded my expectations - I'm definitely going to attend more Glamour-hosted events. I got to learn what Glamour stands for and the four sections their magazine is now sectioned into. Live. Think. Feel. Look. On another note, Did you know that Asanda is the FIRST black female editor for Glamour magazine? I sure as hell didn't. It's info like this that needs to be talked about on every news outlet, the news itself and trending on twitter. She is a female powerhouse who is humble and has readers, her vision for Glamour at the forefront of the Magazine. 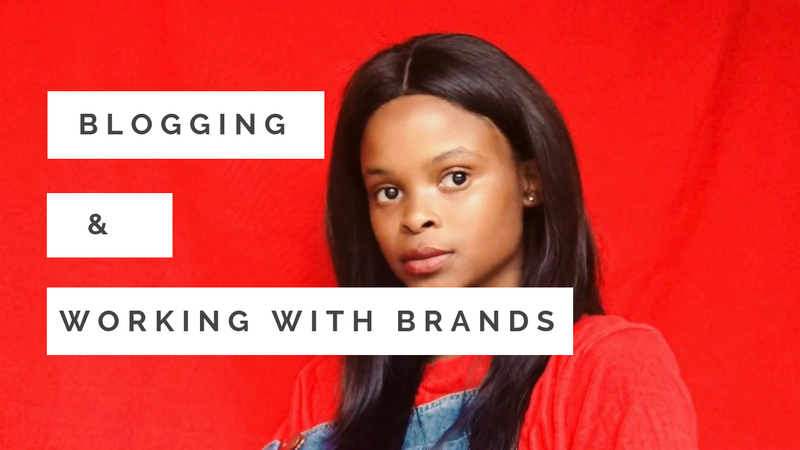 Asanda revealed to us just some of the topics that Glamour would be covering in their Think sections. One of the topics that caught my attention was "Gender Neutrality". Most people don't even know that there beings out there that are non-binary and gender neutral. This for me just gave me the glimpse of the revolutionary topics that they will be discussing going forward. It takes away from being a regular magazine catered to women but it gives insight, thought and perspective on issues that should be talked about more in every form of. 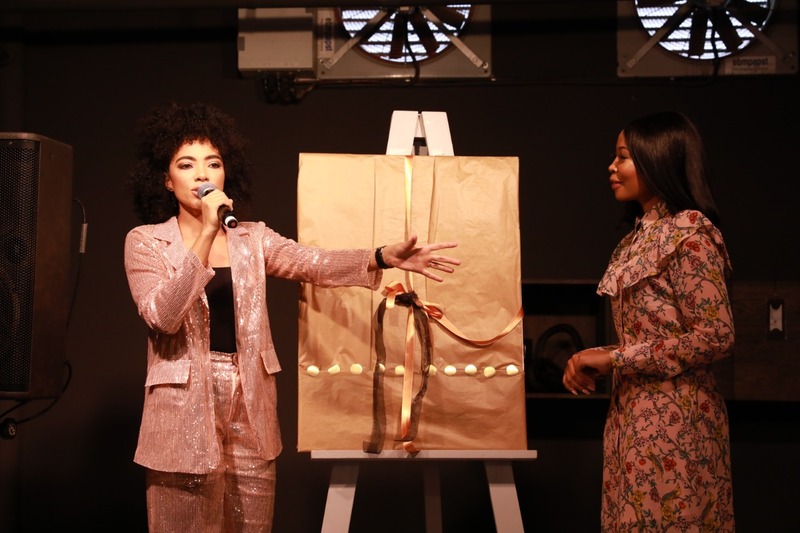 Amanda Du Pont was revealed to be the October cover star! In her speech she encouraged the boss babes there to support one another another and to tell the beautiful fellow sister we see in public or be it wherever that she's beautiful, not to only just think it but to actually voice it. She spoke about something that is important in our fight against the patriarchy as women - unity amongst ourselves. She also told us about the value of being yourself. The Gin was colorful - pink, purple and blue. Proudly brought to us by Mirari Gin. I think this is a fairly new brand because they lack social media presence? Of course that is to be confirmed by, if not me , you - the reader. The gin was delicious and tasteful decorated. I could say they were presented in a way that's meant for it to be Instagram-worthy. The nibbles were quite filling. Mini-burgers, an artistically presented salmon thing and these really delicious mini cakes which were a mixture of peanut butter and chocolate flavoring creating all sorts of magic within my mouth. Well-served, decorated and quite scrumptious, Really worth more than the R150 paid. 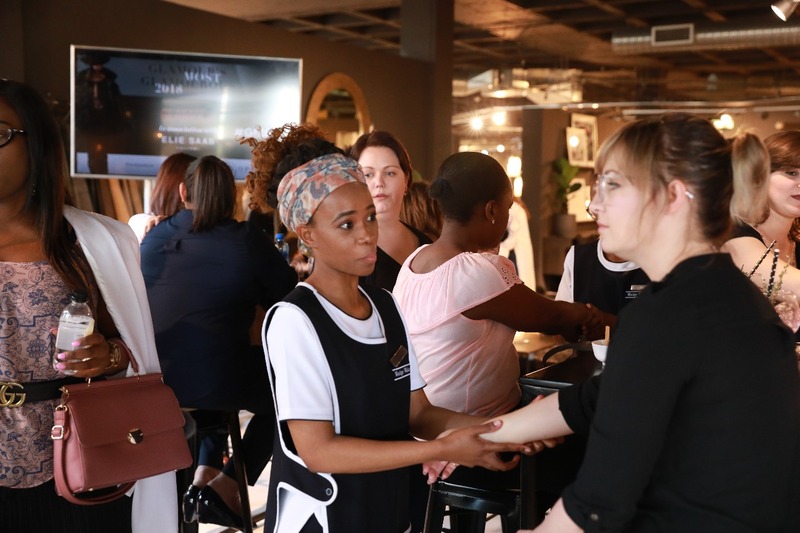 you could have your hands massaged while enjoying a glass of gin, over a good conversation. it was a tranquil vibe. A room full of go-getting babes coming together to network, unite and just be fabulous in every way. Glamour's sponsors were there, OPI, Ellie Saab (A fragrance to die for! It retails for 1.5k though) and Elemis. All glamorous brands. To sum it all up, it was a perfect Sunday afternoon and I thoroughly enjoyed myself. I walked away not only more confident than I was when I had walked in but, more ambitious and more determined to grace you with my BOSS BABE spirit and consistent posts. Feel Free To Drop Your Comments! Your Opinion Matters! Talkative, Energetic and a foodie at heart.